On April 2 and July 9 respectively, two Rafale M in the latest "F3" standard (the M42 and the M43) were delivered by Dassault Aviation to the French Navy "Base d'aéronautique navale" (Naval Air Station) of Landivisiau in Brittany. The M42 was assigned to Flottile (Fighter Squadron) 12F while the M43 will soon join Flottile 11F. By 2017, the French Navy expects to receive the last of the ten Rafale M "F1" upgraded to "F3" standard as well as three more new aircraft. The total number of Rafale M fighters in the latest "F3" standard deployed by the French Navy will then be 42. In October 2014, the French Navy took delivery of the first Rafale M upgraded to the F3 standard. » Changes to the weapon store stations. » Interception and air-to-air combat with 30mm gun and Mica IR/EM missiles (+ Meteor missiles from 2018 onwards). » Ground support with 30mm gun, GBU-12/24 laser-guided bombs and Hammer precision-guided bombs. » In depth strikes with Scalp cruise missiles. » Sea strikes with the Exocet AM39 Block 2 missile and other air-to-surface weapons. » Real-time strategic and tactical reconnaissance with the Areos pod. » In-flight refueling from one Rafale to another (“buddy-buddy”). » Nuclear deterrence with the ASMP-A missile. The French Carrier Air Group consists of three fighter Flotilles (11F, 12F and 17F), The E-2C Hawkeye Flottile (4F) and a detachment from Helicopter Flottile 35F for Search and Rescue. Flotilles 11F and 12F fly on Rafale M while the 17F fly on Super Etendard Modernisé (SEM). 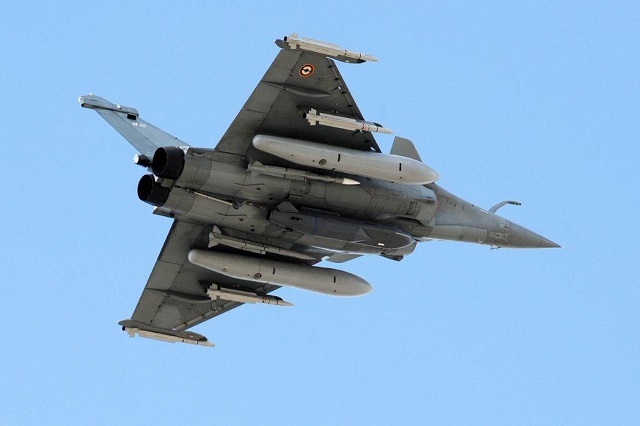 In the summer of 2016, SEM will be removed from service and aircraft carrier Charles de Gaulle will transition to an "100% Rafale" fighter air wing. In December 2014, the French Navy evaluated the future F3R standard of the Rafale with Meteor missiles. Compared to the latest F3 standard currently in service, the future F3R standard will also allow the Rafale M to carry the new laser designation pod in its air to ground missions and a new refueling pod essential in operations around the CSG (carrier strike group). The first Rafale M F3R is expected to enter operational service with the French Navy around 2020.